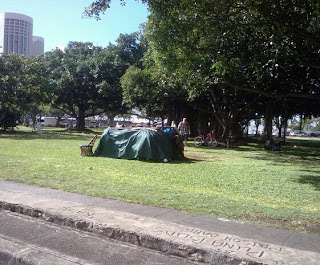 Many speculate about the cause and effect of homelessness in Hawaii, but to this date, there has not been (1) a comprehensive study to figure out who the homeless are, or (2) a program based on that analysis to develop targeted, strategic interventions. So it's no wonder that the many and varied "solutions" cobbled together by well intended decision-makers have not ameliorated the problem. But 100,000 Homes Campaign's practical, common sense approach could make some inroads. The two aforementioned steps are part of 100,000 Homes process to ensure that public monies are better focused on providing housing for individuals who need them most. Read more in, Registering the Homeless, from this month's edition of Governing. For more on housing issues in Hawaii, view the Affordable Housing archive.